This started out as a doodle of a big comfy chair, a la Mary Engelbreit. 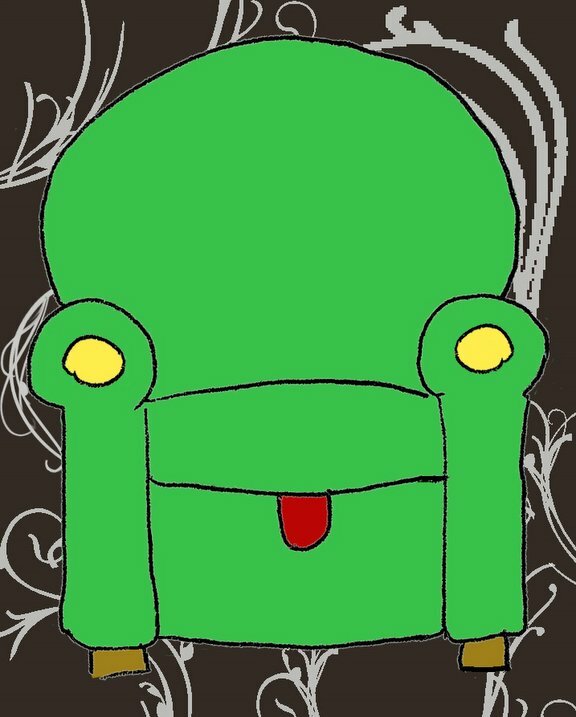 But I started sketching it with the arms and legs first, then the seat cushion. Without the seat back, it looked like a frog. So I just added the tongue and painted it green. Sketched on paper then colored and cleaned up in photoshop. The background swirls are a photoshop brush from Miss M.
Oh, this is wonderful. It made me laugh out loud. I am a big fan of frogs. So funny, its great where your mind can take you sometime. It also reminds me of a sock lost in the seat cushion. The frogs are beginning to gather in our pond now but I hope none are the size of an armchair - very funny! You have a great way of seeing things. Funny!! who would imagine this~nice job!